Teutonic precision in tangible form. Introduced first in platinum in 2016, then in 18k pink gold last year, the Richard Lange Jumping Seconds is a recent enthusiasts’ favourite, being a logical combination of complications executed in quintessential A. Lange & Söhne fashion. But unlike say, the Triple Split chronograph, the Jumping Seconds is not over the top, but instead restrained, and perhaps a bit cerebral. Thanks to Lange, I got to wear the Jumping Seconds prototype – watch “000/100” in platinum – for almost a week, giving me a chance to observe it up close. At 39.9mm in diameter and 10.6mm high, the Jumping Seconds is one of the smaller complicated watches in Lange’s current line-up. Its proportions are fairly elegant, wide and slim-ish, and so it wears well. In fact, the size of the Jumping Seconds means it feels hefty in hand, but not quite as dense as other Lange watches, which tend to be thick relative to their diameter. 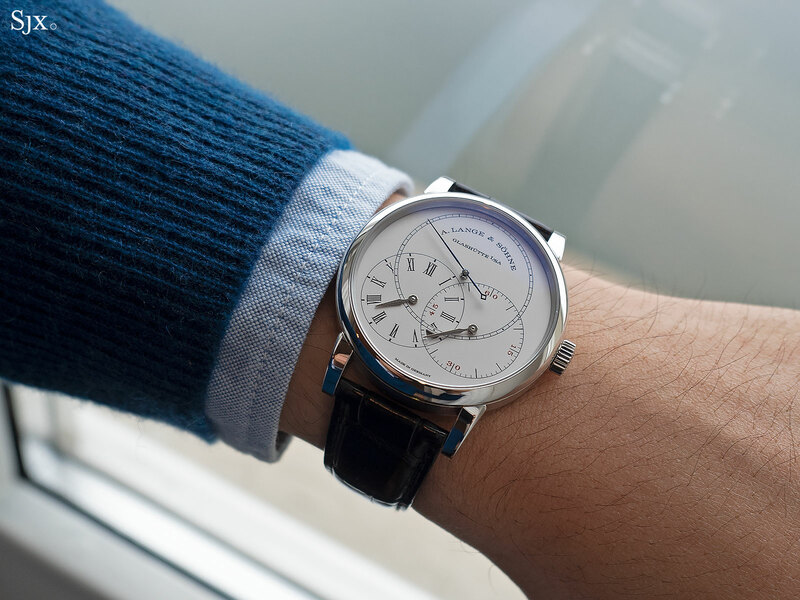 Like many Lange watches the Jumping Seconds feels formal in style and form, but it is palpable presence. In a quiet room the deadbeat seconds is faintly audible. The Jumping Seconds is a simple watch in terms of functions – showing just the time plus the power reserve – but powered by a notably complicated movement, the cal. L094.1. 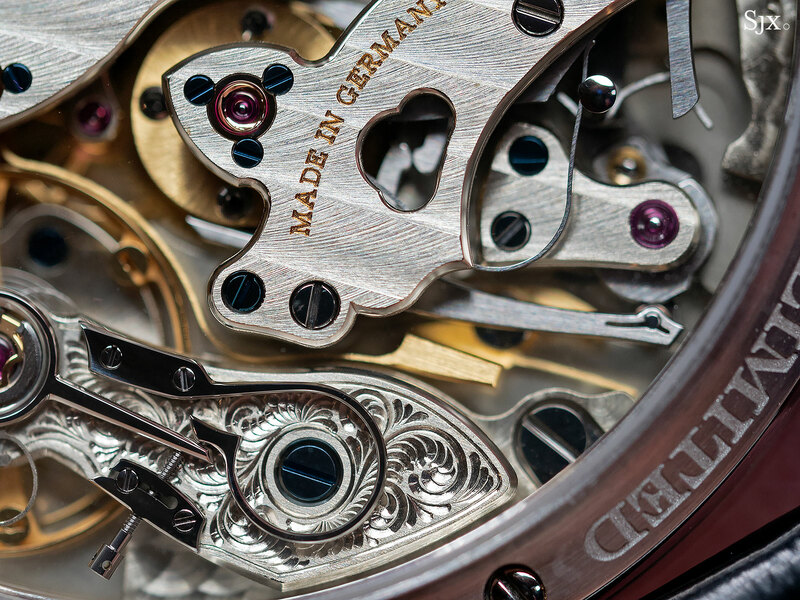 In that sense the movement is typically Lange, which favours complex, mostly traditional engineering – a tortuous route to simple ends. The Jumping Seconds has four complications, one being the power reserve and the other three being sensible complements to each other. The most obvious is the jumping, or deadbeat, seconds, that moves in one-second ticks. Because it moves in discrete steps, the seconds hand adds dynamism to the watch, gently ironic for something labelled “deadbeat” (the name originates from the fact that the seconds stops dead before moving to the next second). The motion of the seconds hand – it lines with up with the markings on the seconds track on every jump – creates the pleasing sensation of greater precision, though it is functionally identical to a sweep seconds. And if observed at exactly the right moment, just as it has completed a jump, the watch appears to have stopped, with the seconds hand frozen. The suspense is momentary and only noticeable just after the watch is strapped on; after a spell the eyes get used to it. The deadbeat seconds is driven by its own gear train that connects to the single barrel inside the watch. Visible beneath a lens set in a black polished cap, a small star wheel that sits on the escape wheel turns once a second, releasing the “flirt” as it turns. 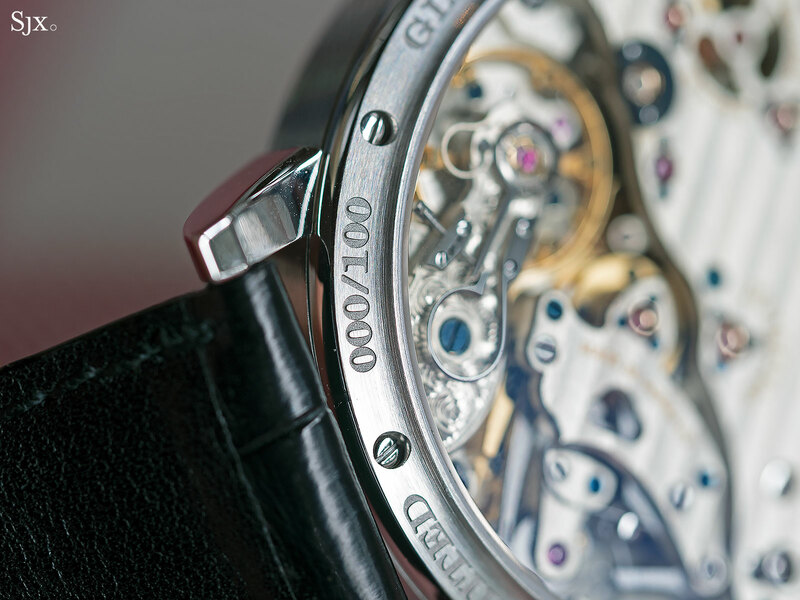 The flirt is a straight, narrow spring that connects to the seconds hand. Each time the flirt is released, the seconds hand jumps forward. The star is beneath the steel cap at left. 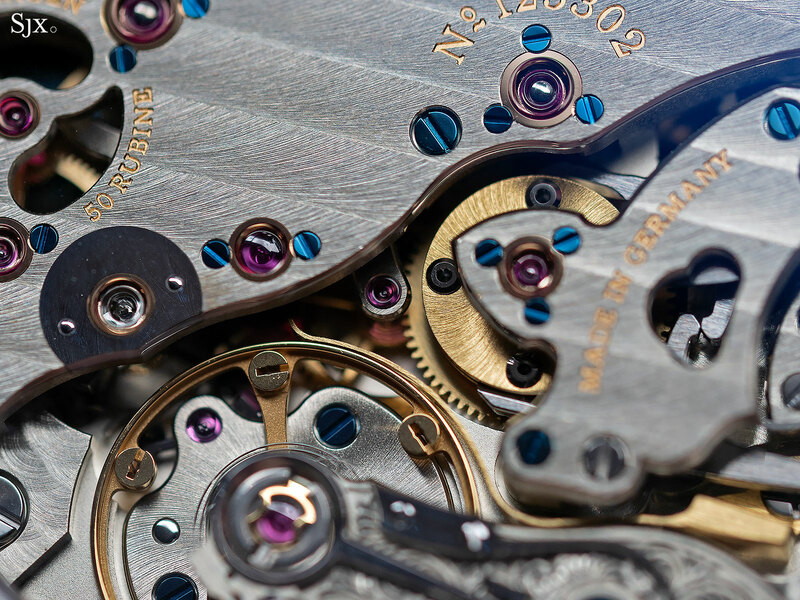 The escapement, on the other hand, has its own gear train equipped with a remontoir, essentially a tiny concentrically coiled spring, attached to the fourth wheel. Visible through an aperture on the three-quarter plate, the blued spring is wound up and unwinds every second. The principle of the one-second remontoir is similar to that inside the F.P. Journe Tourbillon Souverain (which has a deadbeat seconds linked directly to the remontoir), which is why the Jumping Seconds sounds very similar when listened to up close. All that fuss is just for the seconds hand to jump, both completely unnecessary and technically admirable at the same time. It brings to mind the Zeitwerk, which is powered by a large and labyrinthine movement, when the same could have been done simpler (as IWC did with the Pallweber). But not only does the seconds hand jump, it also zero-resets. When the crown is pulled, the seconds hand returns to 12 o’clock and stops, which makes for easy and precise time-setting. It is not a new complication for Lange, having been introduced with the Sax-O-Mat in 1997. But with the deadbeat seconds and constant force mechanism it feels at home. The complexity of the zero-reset, hacking seconds can be inferred from the real estate it occupies, almost a quarter of the movement, leaving the traditional three-quarter plate nearly a two-thirds plate. 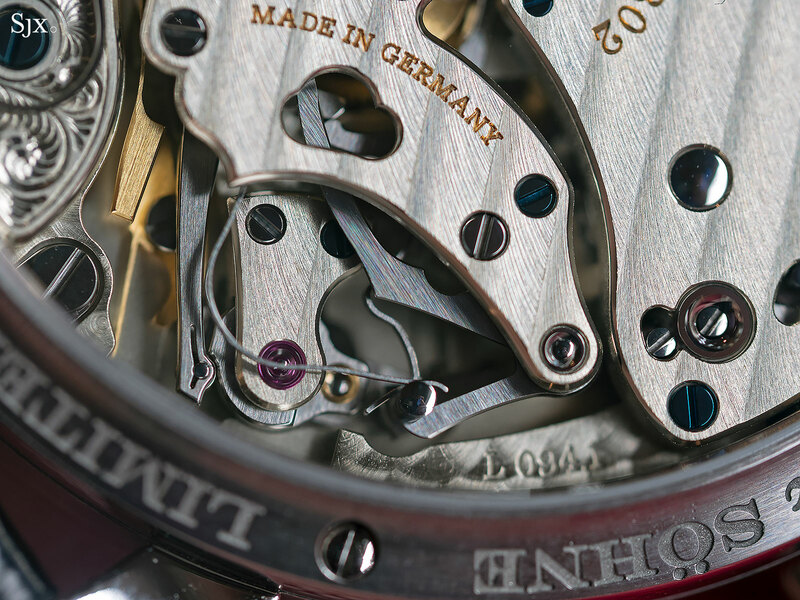 Notably, the bridge for the reset seconds mechanism is one of the most intricately finished components of the movement, featuring one inward angle and six outward points on its chamfered edges. Underneath it hides a mass of springs and levers, a visual synonym for the mechanical complexity behind a simple idea. 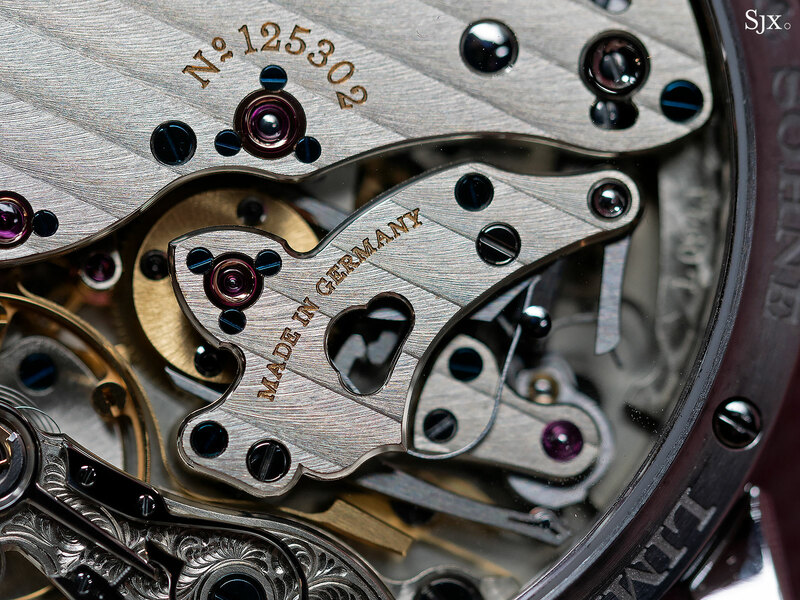 Technical details aside, the movement is good looking, and distinctly different from the average Lange calibre. The nature of the decoration, flashy where the dial is not, means it never gets old. The dial design is a familiar one, being based on a 19th century regulator-dial pocket watch made by Dresden horologist Johann Heinrich Seyffert. It was first used for the Richard Lange Tourbillon, and then later the Perpetual Calendar Terraluna, making the Jumping Seconds by far the most affordable watch with this dial design. 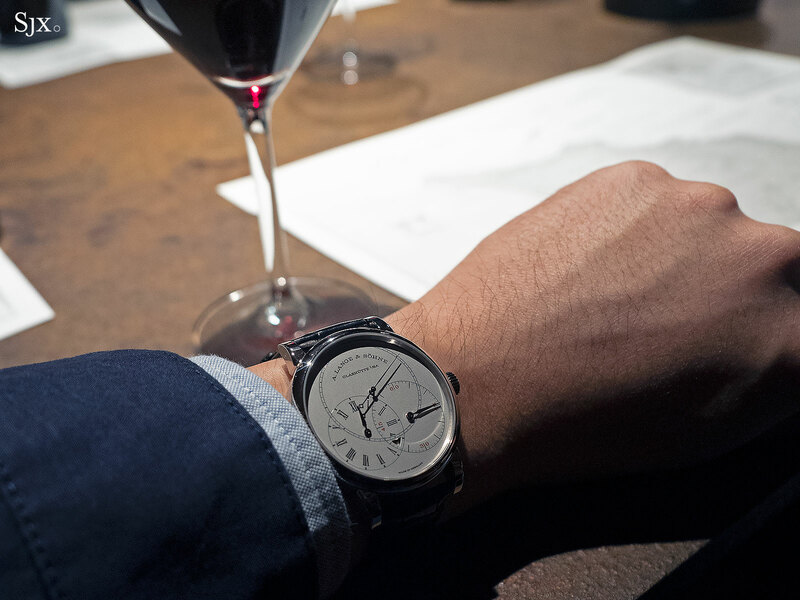 Though made up of classical elements and symmetrical, the dial is novel. Legibility of the individual sub-dials is good, since each is fairly large. But the layout of the dial creates two drawbacks. The first is reading the time. When the hour and minute hands overlap, it takes a moment to comprehend the time. The second is perhaps nitpicking: the seconds hand appears to sit unusually high on the dial. On an ordinary watch the height is camouflaged by hour and minute hands below, but here the seconds hand is isolated on its pinion, which also means it casts a tall shadow. 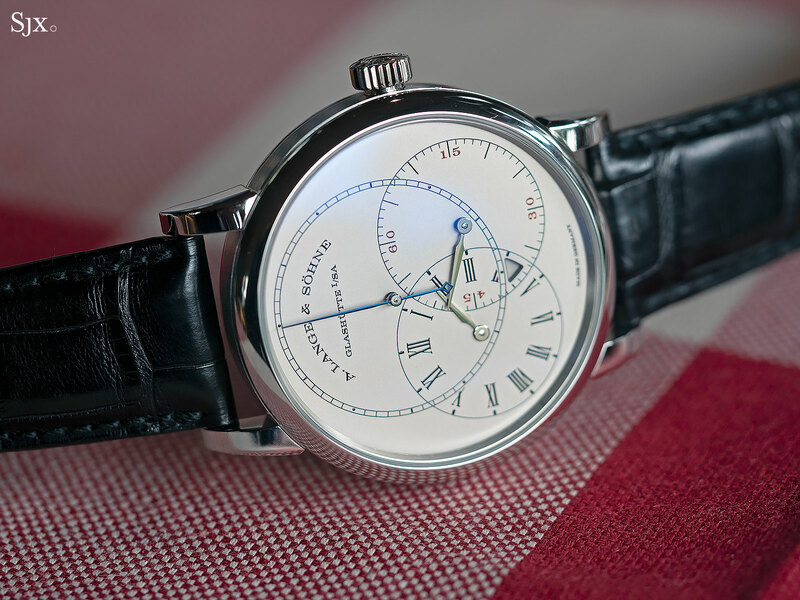 The Richard Lange Jumping Seconds in platinum (ref. 252.025) is priced at US$84,200, and is mostly sold out though a handful might be available at some retailers. Currently available, the more recent Jumping Seconds in pink gold (ref. 252.032) is priced at US$78,600. 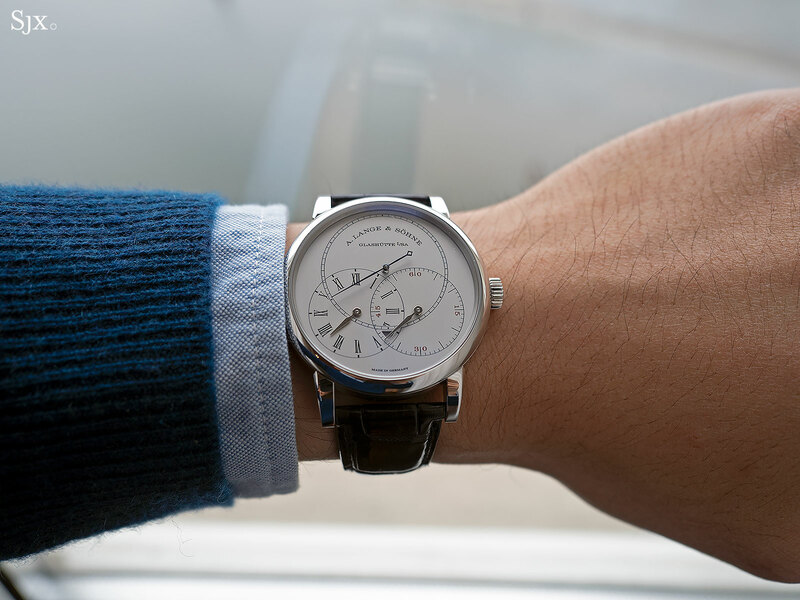 The austere regulator-style watch now gets a warmer case hue. 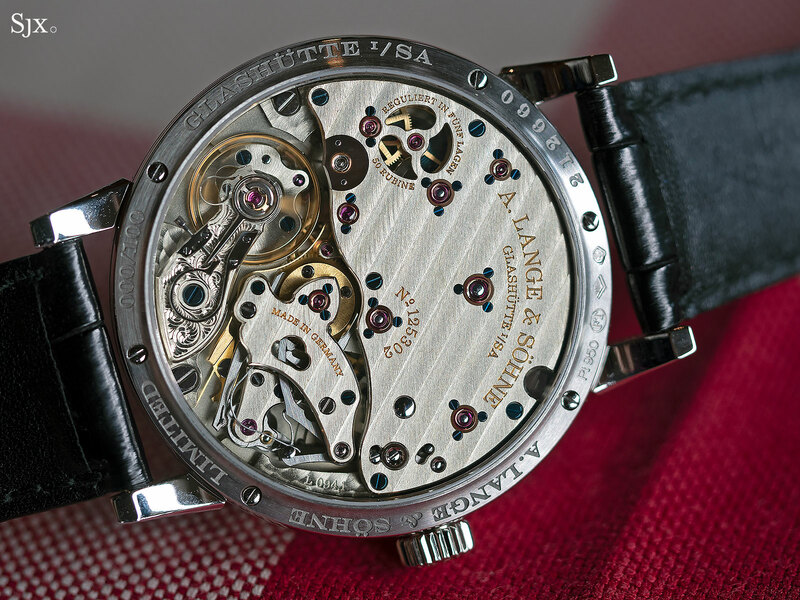 We go up close with Lange's critically acclaimed Richard Lange Jumping Seconds.